A bohemian club located just steps away from Thomas Circle in the teens and 1920s must have been an unusual sight to behold for those lucky enough to locate its entrance and know about its whereabouts during the era. It was located at what was then 3 Green Court, across from what is today’s Green Lantern gay bar, located in an old stable building in an alley just southeast of Thomas Circle. 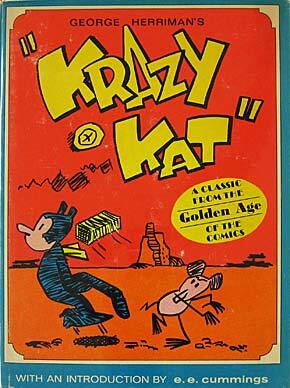 It was coined the Krazy Kat. The club’s entrance was along the side of the Green lantern building today leading to Massachusetts Avenue, with a small sign that read “Syne of ye Krazy Kat” seen in the images here, taken on July 15, 1921, along with a warning at the top of the door that read “All soap abandon ye who enter here.” Inside, patrons found a tree house reached by a precarious ladder, pebble floor, and al fresco dining. It was the site of frequent artist exhibitions and painting classes. 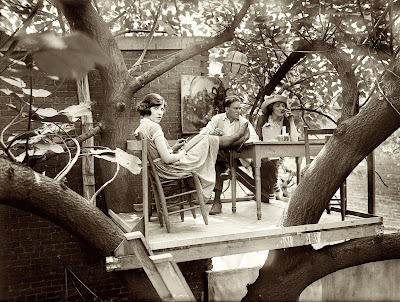 The establishment was described by the Washington Post in 1919 as “something like a Greenwich Village coffee house” that had “gaudy pictures created by futurists and impressionists.” Its name came from a popular comic strip at the time titled Krazy Kat, whose main character was copied for use on both the front door and on shirts worn by the waiters. The strip was the genius of artist George Herriman, who created a stir at the time because he stated that Krazy Kat was androgynous: sometimes Krazy was a male, and sometimes a female, willing to be both. The cartoon strip ran in major newspapers throughout the country, and featured two protagonists: Krazy Kat and Ignatz, a mouse. Despite prohibition, the club offered liquor to its patrons, and was raided several times during its existence from about 1918 to about 1925. 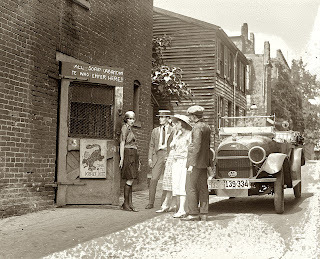 The Sheppard Act introduced prohibition of intoxicating liquors in Washington, DC effective on November 1, 1917, a full two years before a national prohibition. Both were repealed in 1933. One raid in February of 1919 was initiated when a police officer heard a gunshot emulating from the club at 1 am. The raid resulted in “25 prisoners, including three women — self-styled artists, poets and actors, and some who worked for the government by day and masqueraded as Bohemians by night.” Most of those arrested faced charges of drinking in public. (Washington Post, February 22, 1919). The club was run by Cleon “Throck” Throckmorton, seen at the easel on the terrace of the club, and outside the entrance. 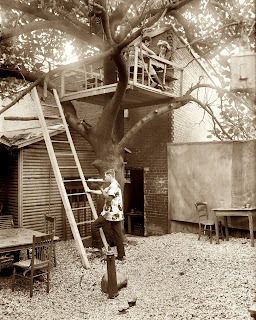 He had been born in Atlantic City in 1897, and studied engineering at Carnegie Tech and at George Washington University before embarking on a career as a landscape and figure painter. His parents, Ernest U. and Roberta Cowing Throckmorton moved to Washington, DC and resided at 1536 Kingman Place, NW, just off of Logan Circle. After a few years he turned to the theatre, assisted on the designs for The Emperor Jones (1920), and later created the sets for many Eugene O'Neill's plays including All God's Chillun Got Wings (1924), S.S. Glencairn (1924), In Abraham's Bosom (1926), Burlesque (1927), Porgy (1927), Another Language (1932), Alien Corn (1933), and others. By his retirement in the early 1950s he had designed sets for over 300 plays. Throckmorton also drew up architectural plans for such summer theatres as the Cape Playhouse in Dennis, Massachusetts, and the Westport (Connecticut) Country Playhouse. He also served as the first art director for CBS in the early days of television. He died in 1965. His widow, Juliet Brenon, was a stage and screen actress in the 1920s. She was later a contributor to Yankeee magazine, writing, among other subjects, about Eugene O'Neill, E.E. 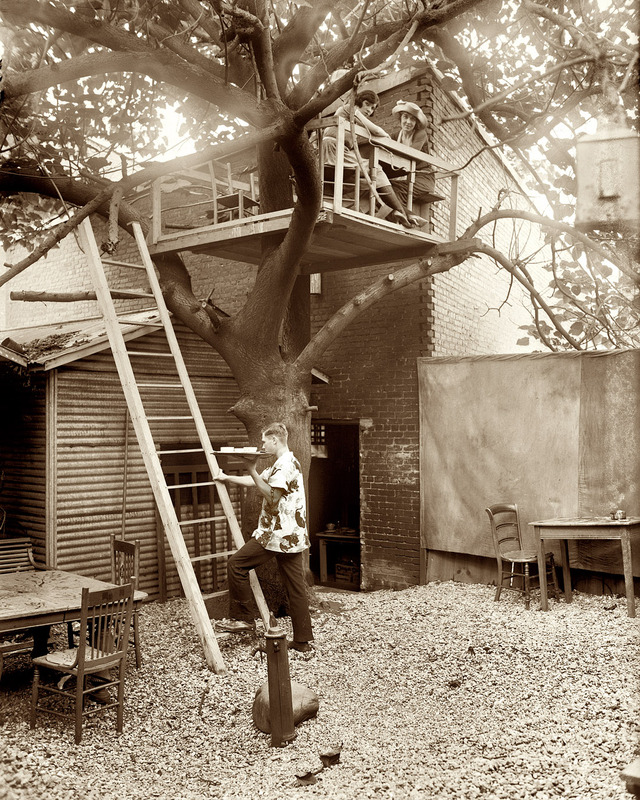 Cummings and other well-known people who had frequented her husband’s Greenwich Village studio. While the building that houses the Krazy Kat is no longer there, replaced by a building used as a gym today, several artifacts from the club do remain. Throckmorton’s lusty dancing girl sketches are displayed at Volare, located in Greenwich Village at 147 West 4th Street in New York City. The owner reports that the pictures conveyed with the establishment about 1984; previously, it has been called Mother Bertolotti’s, which had been established in 1939, and before that, a restaurant called Polly Holliday’s. 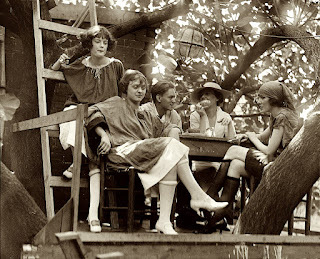 The photographic images seen here were taken on July 15, 1921 at an unusual bohemian club and speakeasy known as the Krazy Kat. 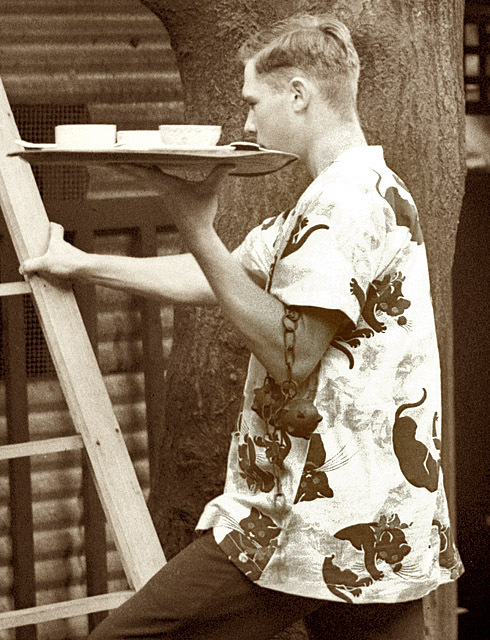 It was named after the Krazy Kat cartoon, reproduced on the waiter’s shirt, and existed from about 1917 to 1925. Images courtesy National Photo Company Collection (glass negatives), Library of Congress Prints and Photographs Division. Cartoon image courtesy eBay.com.